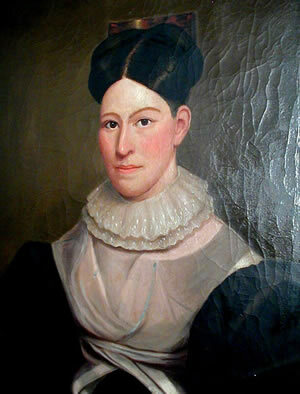 Oil on canvas portrait of Mrs. Charles Johnson, circa 1840. The history of Newtown in the nineteenth century is synonymous with the Industrial Revolution. Early in the century, several small industries developed along Newtown's Rivers such as the Pootatuck, which supplied power to the water wheels of these shops and mills. In several areas of town small hat shops developed, but they were short lived. The larger factories that developed in the neighboring towns of Danbury and Bethel could produce hats so much more cheaply and efficiently that the small local shops could not compete. By the 1880's production of hats here had stopped. Button and comb production was another thriving industry in 19th century Newtown. 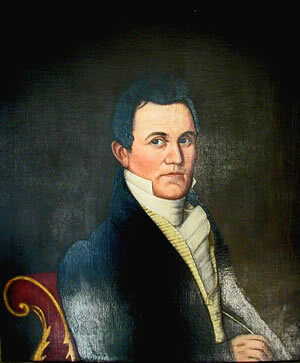 Since Newtown was primarily an agricultural town, it was natural that an industry that utilized a waste product from animal husbandry such as horn, bone, and hoof would develop and do very well here. At one time there were as many as 14 button shops in full production. After the Civil War, however, as plastics took over as the preferred material for both comb and button making, the shops began to close. By the beginning of the twentieth century just two of the button shops remained in business. One, S. Curtis and Co., survived by converting to the manufacturing of cardboard boxes and survives to this day as Curtis Packaging, Inc. The other suffered a disastrous fire in 1926 and closed for good. Another industry with which Newtown has been associated since its beginning, was the manufacturing of rubber products. In the early 1850's shortly after Goodyear perfected the vulcanizing process, two factories were built in the Glen section of town, just north of Sandy Hook, which specialized in the production of rubberized clothing. They also produced rubberized fabric fire hose and special rubber belts that drove machinery. Under the name New York Belting and Packing, the production of all other products stopped and the factories concentrated solely on the production of belting and fire hose. At the turn of the century, the New York firm decided to consolidate its manufacturing facilities and moved from Newtown. Fortunately a competitor, the Fabric Fire Hose Co. of Rhode Island, decided to take advantage of the fire hose facilities which were already set up here and they took over the factories. Newtown was a major producer of fabric fire hose until the mid 1970's when that company closed down and left town. After the Civil War, Newtown also became a major resort town. Main Street boasted several major hotels which hosted people coming out of the city to spend a week in the country-side, enjoying the rural charms of Fairfield County. Although Newtown ceased to be a resort area shortly after the First World War, its hotels continued to serve the Village and surrounding area until the post World War II period. One of the largest of the resort hotels was broken up in 1930 to make way for a new library that had been donated by the town's benefactress, Mary Elizabeth Hawley. The other major hotel, the Yankee Drover, did a limited business until it burned in 1981. Several lesser establishments were converted into private dwellings.